by Annalee Newitz, excerpted from In Search of Adolph Sutro in the "San Francisco Bay Guardian", January 13, 1999. Interior of the Sutro Baths. 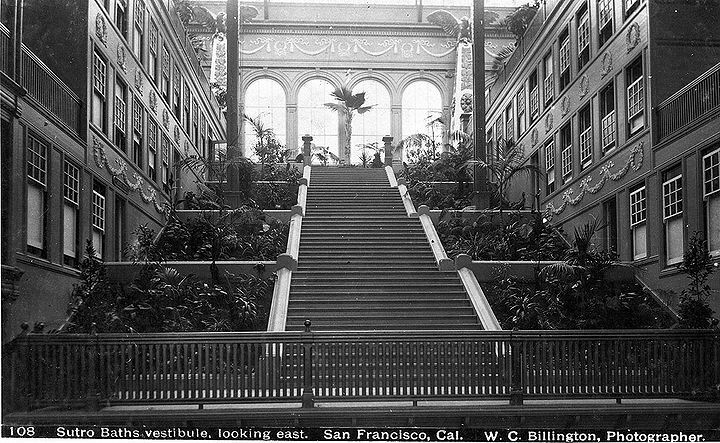 Sutro Baths exterior, before 1906. Cliff House is in the background. Built in 1896 by former mayor and eccentric mining tycoon Adolph Sutro, the Sutro Baths were a wonder of their time. 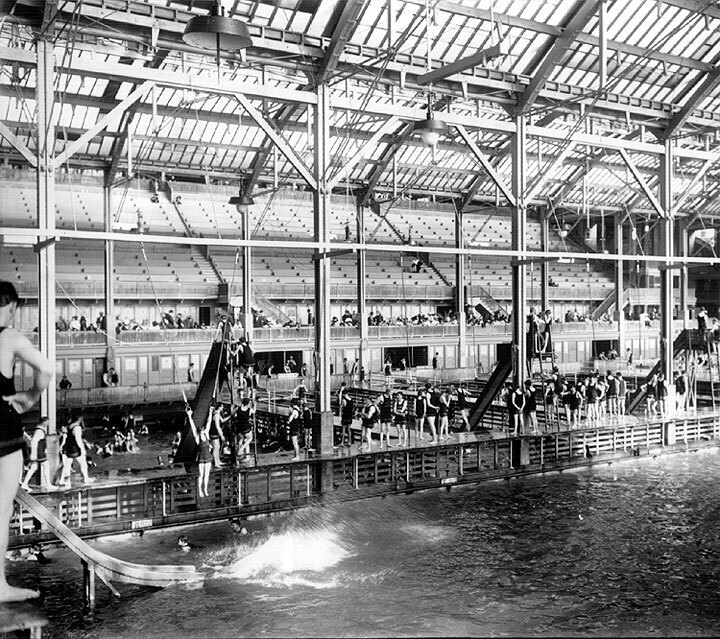 The biggest indoor natatorium of its kind, the Baths used sea water from adjacent Ocean Beach to fill six saltwater pools, and featured one freshwater pool, hundreds of dressing rooms, slides, springboards, a large amphitheater, and later an ice rink. 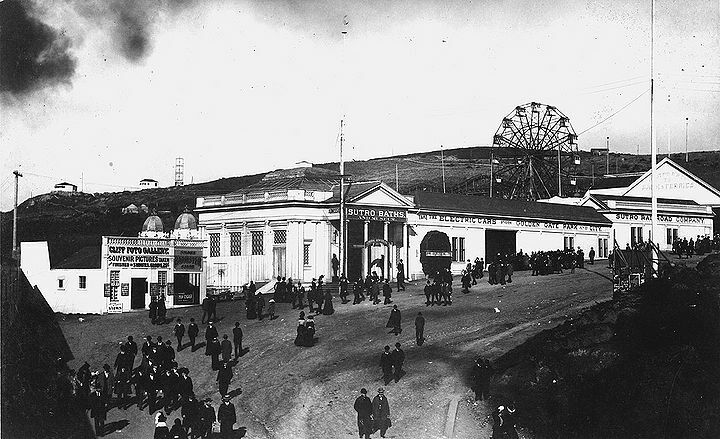 Sutro died while the Baths were successful, and the attraction continued in popularity until it fell into disuse during the hard economic times of the 1920s and 30s. Planned development along the oceanfront property and multiple fires meant the Baths’ demise in 1966. The Baths remain a centerpiece of the west side of the city’s history and its ruins are still explored by locals and tourists alike today. 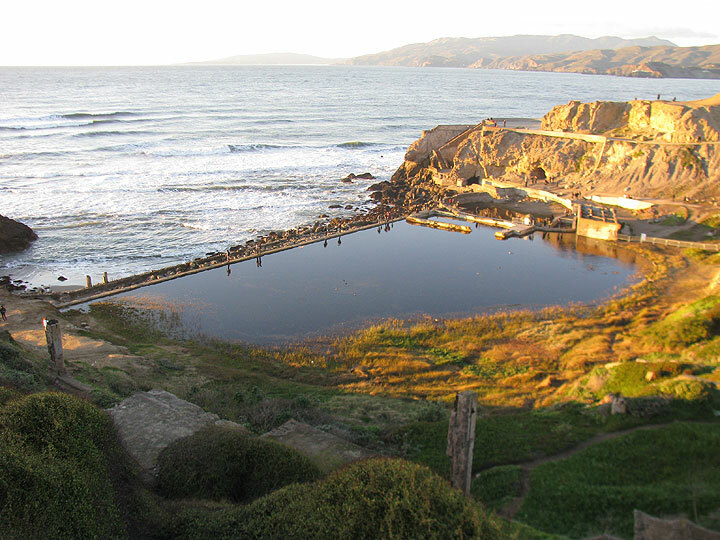 Following a steep dirt road down to the place that a faded sign refers to as Sutro's Baths, I became smitten by the idea of someone building a bath house so vast in what was at that time a relatively deserted part of the City. I couldn't wrap my mind around what the thing would have looked like. On a second visit, I brought my archaeologist friend Alison Boles along, and she immediately began sifting through the rubble, looking for layers. The more we found, the more information we wanted about what we saw: an intriguingly huge stone pool; a smaller oval pool; a decaying grand stairway of cement; twisted and rusted metal hooks all along the edges of the pool; an odd square room divided up into small cells; a tunnel blasted through the rocks which fills with water during high tide; and dozens of incomprehensible remains of wooden doors, water traps, and pipes that looked like something out of Terry Gilliam's industrial nightmare film Brazil. Sutro's Baths, as Alison and I discovered over several months of sporadic research, were in fact Adolph Sutro's idea of a solution to the industrial nightmare of late nineteenth century working life, corporate greed, and economic depression. But the history of his Baths is, ironically, the history of how San Francisco came to forget about one of its greatest benefactors and Progressives, a wealthy property owner whose successful mayoral campaign in 1894 nevertheless boasted the anti-big business slogan, "The Octopus Must Be Destroyed!" The Octopus as readers of turn-of-the-century San Francisco rabble-rouser and novelist Frank Norris already know, was populist shorthand for huge, monopolistic corporations like the Southern Pacific Railway (owned, in part, by magnates Leland Stanford and Mark Hopkins). One of Sutro's lifelong projects was defeating the monopoly that the Octopus-like Southern Pacific Railway held over U.S. railroad systems and the trains in San Francisco itself. While the Octopus squeezed local businesses and raised fares, Sutro imagined that his Baths would do the opposite by providing the masses with healthy, safe, low-cost entertainment. Having already turned his home at Sutro Heights into a free public park, he believed that his Baths would continue a tradition of what he called in his will the public resort or park. When Sutro discovered that Southern Pacific wouldn't give SF train riders transfers--forcing them to pay two five-cent fares to cross the City and get to Sutro Heights--he built his own railway lines and public transportation and charged the flat five cent rate. Because a typical clerk in the 1890s made roughly twelve dollars a week, twenty cents just for a round-trip train ride was in fact rather pricey. Like his Baths, however, Sutro's Railroads on Greenwich and Clement Streets are now long gone. These days, its hard to imagine someone spending their own money to build cheap transportation and entertainment for the masses. And there's no denying that the scope and complexity of the Baths were geared to masses. 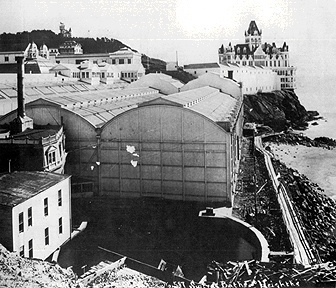 When they opened in April 1896, the three-acre Baths housed three restaurants; a museum; five large, salt-water bathing pools of varying temperatures which were filled and drained by the tides coming in through a tunnel hollowed out of the adjoining rocks (visitors today can walk inside this tunnel); a huge outdoor tidepool (the u-shaped contour of which you can still see, full of seawater and plants); bleachers to seat several thousand; a house band; and attractions such as the haunted swing and the panorama of the world. Up to 25,000 bathers could fit into the Baths on a given day, and more than 1600 could be accommodated in the 517 private dressing rooms (conveniently, there were 40,000 towels available for rent). The entire establishment was constructed inside an enormous three-peaked glass enclosure. According to visitors' reports, a great deal of the structure was made from stained glass, and the baths below were frequently dappled with rainbow colors from the sun shining down through the roof. Sutro placed dozens of display cases full of his memorabilia from trips around the world--including, weirdly enough, a mummy--all throughout the halls to make his attraction educational too. The place almost sounds like a direct ancestor of the sumptuous discos and raves for which San Francisco is still famous. 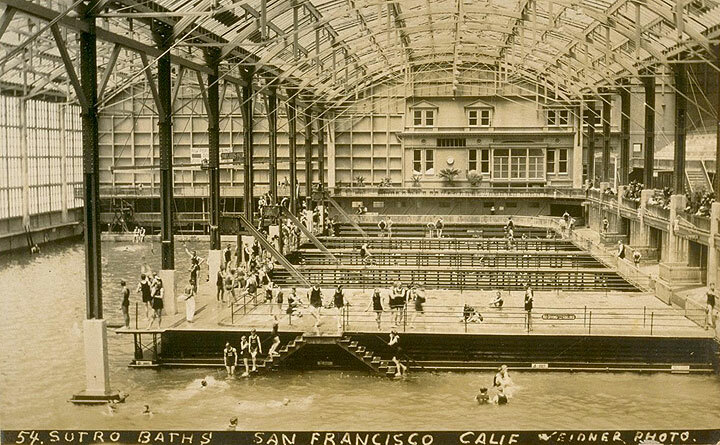 Although the Baths were wildly popular for the last months of Adolph Sutro's life in 1898, they fell into disuse during the twenties and Depression-plagued thirties. Landscape architect Elliott Insley writes that by 1937, income from the Baths was so minimal that Sutro's grandson converted the largest swim tank into an ice rink; a later owner removed all the swim tanks to make way for one giant ice rink and museum. Then, inevitably, the historic structure was threatened by condos. Robert Fraser bought the decayed ice rink in 1964 and planned to raze it so he could build some seaside properties. The last remnants of the Baths were finally destroyed by arson as Fraser was demolishing them in 1966 (hence the melted look of some of the steel and glass fragments you can find near the tanks). Luckily, the condos never materialized, and the National Park Service bought the beach and Bath ruins in 1980. Although the Baths today are dotted with a few danger signs, nothing has been done to change them since that time. What remains are some large tanks, a battered chunk of the pump house (this is the square structure divided into several small cells), the tunnel mechanism which allowed the tides to fill and empty the swimming pools, and outlines of the bleachers and grand entrance stair. People are allowed to climb all over the crumbling stones unhindered, which has unfortunately led to some vandalism. Next to the Cliff House at Great Highway and Point Lobos. 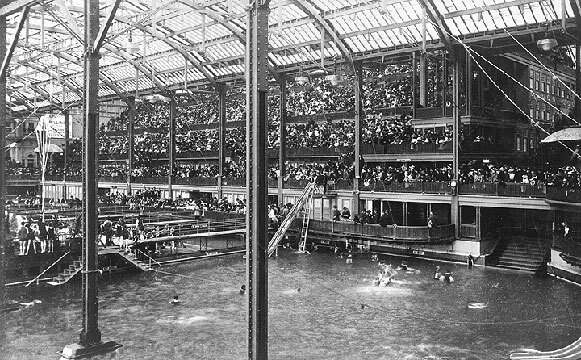 The baths, built by legendary local weirdo Adolph Sutro must have been a sight to behold: six huge indoor pools filled with ocean-water, surrounded by seats for 7,000 spectators. The baths were replete with statuary and plant conservatories featuring palms and real Egyptian relics, like something out of Norma Desmond's wettest dream. The baths also housed several restaurants, a museum, trapezes, and water-slides. But like so many of San Francisco's magnificently weird landmarks --- Fleishacker Pool, Playland at the Beach, the Fox Theater--the Sutro Baths were too good to last. By the 1950's, the baths were no longer profitable; they were finally turned into an ice-skating rink. But even that lost money, and by 1966 the owners were about to go bankrupt. On June 26th, 1966, just as a wrecking ball was poised to begin smashing in the walls of the legendary Baths (and two weeks before the bankruptcy that would have ruined the owners) a mysterious fire broke out and burned the whole place to the ground. It turned out that the building was heavily insured; the owners collected their massive settlement and quickly left town, leaving many suspicions but no tangible evidence of fraud and arson. The ruins of the baths still linger as one of the most mysterious sites of San Francisco. Beneath the ruins of the Sutro Baths winds an elaborate labyrinth of caverns and tunnels. Over the years, a few intrepid explorers have ventured into these mysterious passages; whether all have ventured back out into the light of day is another question. Many wild rumors have circulated in San Francisco's occult underworld concerning the nature of the creature(s) beneath the Sutro Baths. LaVey has expressed the opinion that the creatures are like unto the entities which populate the tales of H.P. Lovecraft. Lovecraft, a member of America's unholy trinity of great horror writers (the other two are Poe and San Francisco's own Ambrose Bierce), wrote about mysterious, malignant entities that enter our world by way of mysterious "doorways" to other dimensions. According to Lovecraft, spells of black magic, like those in the legendary Necronomicon of the Mad Arab Abdul Alhazred, may be used to summon these creatures.